Get a large 1 gallon freezer bag and squeeze the juice of the orange and limes into the bag. Add the oil and mix thoroughly. Meanwhile, put all the dry spices in a small bowl and mix together. 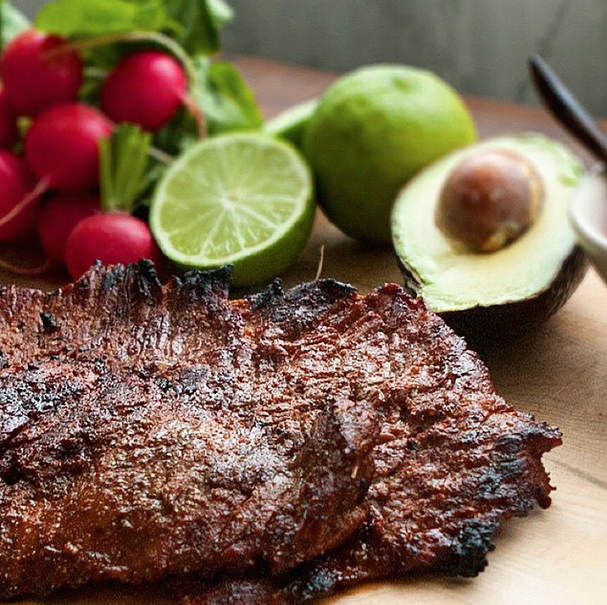 Place the flap steak on a cutting board and rub the spice mix onto both sides of the flap steak. Gently rub the spice into the meat, avoiding not to massage it in too hard. Place the flap steak into the freezer bag and seal tightly after getting as much air out of the bag as possible. Massage the citrus oil mixture into the steak thoroughly and marinade in the refrigerator for at least 2 hours. Heat the grill up to very high heat. Remove the carne from the bag and discard the marinade. Place directly on the grill and cook about 3-4 minutes per side. The grill may flare up from the oil in the marinade. No problem. This adds to the flavor of the carne. Once done, remove from the grill and rest the carne for 5 minutes. Always cut against the grain!